White oak is prized for its density. It is water and rot resistant, which makes it perfect for whiskey barrels. But eventually whiskey barrels crack, split, and become unusable for aging whiskey. That’s when they get recycled into Whiskey Barrel Oak Chips. 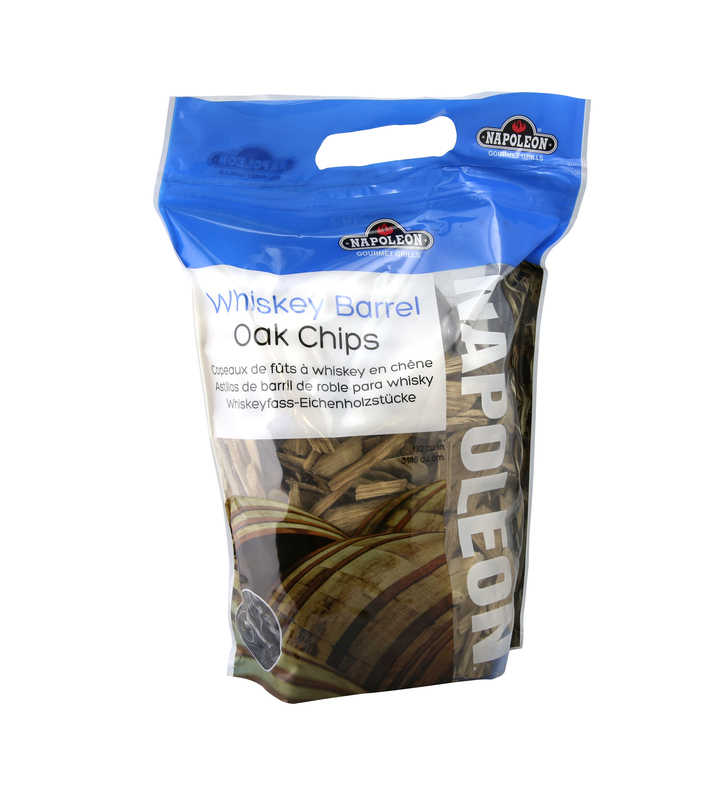 When used, these Whiskey Barrel Oak Chips give off a strong, but not overpowering, smoke flavor that finishes with a hint of aged whiskey. This smoking chip is best paired with bold meats like beef, bison, lamb and game. To use these Whiskey Barrel Oak Chips, soak them in water for at least 30 minutes before use. You can also soak them in cabernet sauvignon, merlot, India pale ale, grape, cranberry or orange juice for added flavor when smoking. When ready to smoke, remove the chips from the soaking liquid and place them into a Napoleon Smoker Pipe, then place the pipe directly onto the sear plates of a gas grill. You can also place soaked Whiskey Barrel Oak Chips into the integrated smoker tray of the Prestige PRO Series PRO665RISB Gas Grill. When the chips begin smoking, place your food onto the grill and close the lid. Remember to keep the lid closed as much as possible to really get that Whiskey Barrel Oak smoked flavor.